The Days of Johann, an agility dog! : Ruff Rider! You know how much of a proponent I am of dog car safety. If not, be sure and take a look at my Squidoo on the subject. I was pretty excited when I learned yesterday that one of my favorite shopping sites - OnlyNaturalPet.com - is now carrying the Ruff Rider Roadie Elite Dog Safety Harness. 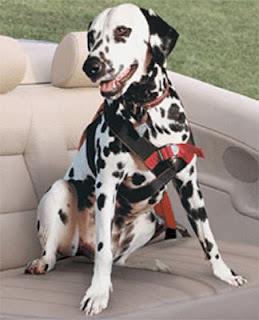 This harness is used by several friends of mine, one of which was involved in an extremely dangerous car accident with her three dogs several years ago. They were injured, but they were all secured and have healed. My friend swears by this harness. The Roadie Elite Dog Safety Harness is tested to US human seatbelt standards. Researched and independently tested, Ruff Rider's Roadie Canine Vehicle Safety/Training Harness keeps the dog you love safe while you are driving, braking or turning and affords the best protection in extreme situations. It easily attaches to any vehicle's seatbelt system, and it includes a built-in short walking lead for all-around use. Every Ruff Rider Roadie is veterinarian-approved & exceeds S.A.E. tensile strength standards for human seat belts. Size 1 10 - 13 lbs. 16 - 17.5 in. Size 2 14 - 18 lbs. 17.5 - 20 in. Size 3 19 - 24 lbs. 20 - 21 in. Size 4 25 - 35 lbs. 21.5 - 23 in. Size 5 36 - 55 lbs. 27 - 29.5 in. Size 6 56 - 70 lbs. 29.5 - 32.5 in. Size 7 71 - 95 lbs. 32.5 - 36 in. Size 8 96 - 130 lbs. 36 - 42 in. Save 5% on orders over $75 at Only Natural Pet Store! Use coupon code CJ75. Get free shipping when your order is over $75. This is a very important topic and one that should be raised more often. Here in Spain it is the law that Dogs must have a seatbelt or harness on. It can save many lives of Humans and Dogs alike. I just wish everyone used them. Yay for Ruff Rider Seatbelts! Chase and Levi have them and like them! I have another kind but mostly ride in our van crate now anyway. But seatbelts are awesome!